Earlier in this year we came across the lasers of‘AdirPro Cube’and were attracted by the brands’ form factor, so now we wish to observe it for a second time. Once we got in touch with the company, we were dispatched with 2 lasers of the ‘AdirPro Cube Cross Line’. This allowed us to study the models called the‘Cube’ and ‘Cube 2-360 cross line’. Both the laser models of ‘AdirPro Cube Cross Line’ were in kits of the brands’ ultimate edition. This means the models comprised of a characteristic mount, batteries, tripod, case, and glasses of the red laser. ‘AdirPro Cube Cross Line’ laser is priced at $99. It is an entry-level kind of a laser manufactured by the company among lasers of this type. This unit is self-leveling and it can manage a slope of up to a 3° of the level line. This is a decent flexibility level although the market does have a few models priced almost the same that can manage a slope of 4°. The laser of ‘AdirPro Cube’ is accurate till a height of 33 feet (i.e. 10 meters) with a deviation of ±2mm. Also, its range is 65 feet complete (i.e. 20 meters) with an assurance that the beam can still be seen (being the maximum range indoor as per the plan). This Cube laser consists of 2 individual line beams of the red laser (horizontal and vertical) that are produced by laser diodes of 635 nm. This laser includes 3 batteries of AAA type and it is all set to get out of its box. The laser of ‘AdirPro Cube cross line’switch is absolutely compact. We always thought that its form factor was highly creative as well as practical. Primarily, it is a plastic cube of about 2-5 by 8 inches which comes with an overmold that is a type of ribbed rubber used for the lasers’protection from small drops or shocks. This is essential as this laser makes use of a pendulum system that is in-built. This system is otherwise fragile without protection when in use or in transit. The Cube’s housing is kind of ‘grippy’, making it convenient to manipulate as well as to get attached with. 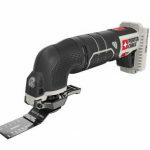 Have you ever handled a small sized tool which has no heat as yet at a fresh construction project? Well, as for me, I somehow tend to throw or drop things due to my cold hands, or in cases when there is no good overmold. So, having a good overmold is very important. 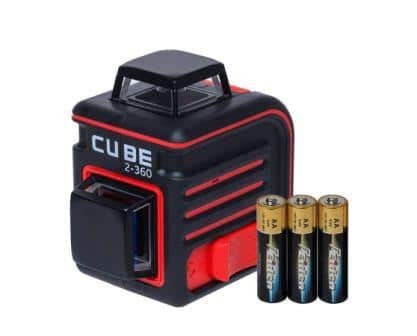 This Cube laser designed into a small sized form can easily be fixed into your pocket or tossed back inside a tool. 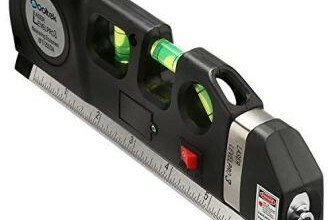 The ‘AdirPro Cube Cross Line’ lasers have a simple way of leveling. All you need to do is simply slide its switch towards the position ‘On’. This disengages the lock of the pendulum as well as it lights up the ‘cross line’ lasers that are forward-facing. Coverage of the field of the ‘cross line’ laser is about 150°, owing to the installation of laser diodes within its set up. 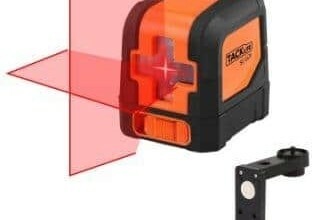 In case the levels are outside the leveling range, there will be beep sounds since this laser comprises of the special pendulum which is self-leveling. It’s an excellent way to avoid being out- of-angle with your tripod or surface, accidentally, during an operation.Also, lastly it is worth noting that this laser is accompanied by a clamp mount. This clamp mount is attached to a thread which is a standard quarter-inch one. It is present at the bottom of the laser, this allows its mounting upon any camera tripod. 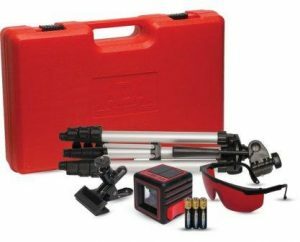 The ‘Cube laser’s ultimate edition accompanies a single pair of laser glasses that are red in color,a 36-inch telescoping tripod, clamp mount-universal type, 3 nos. of‘AAA’ batteries and a single hard case (plastic). A brilliant enhancement to the already established standard laser i.e. the ‘Cube cross line’ is the ‘AdirPro Cube 2-360 Cross Line’ Laser. 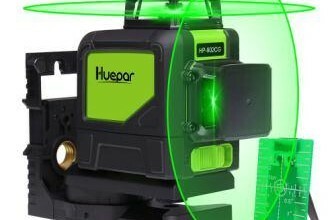 This laser, in addition, has the capability for providing a complete 360° horizontal and vertical line surrounding a room. This is beneficial for setting up drop ceilings, cabinets or any other task which prefers the requirement of a single source for the purpose of leveling the whole room. This type of laser also comes with the system of pendulum level which is up till 4° of self-leveling. In the case where a target is used (isn’t included) then the laser delivers a greater or brighter output level which increases its range of working up to 70 meters (i.e. 230 feet). There are 2 laser diodes of 635 to 670nm which are used for developing the red lasers of the accuracy of ±3mm at 10 meters (33 feet). The switch of this ‘AdirPro Cube 2-360 cross line’type of lasers are similar to the lasers of ‘AdirPro Cube’, this means it is solid. 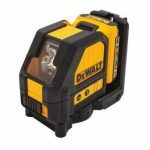 It measures only 3-7 by 8-inch x 3-7 by 8 inch in case you combine the housings of the beam which protrude beyond the Cube’s main body.The ‘Cube 2-360’ laser level controls, however, are slightly more adjustable. It is possible for you to unlock or lock the lasers’ pendulum with the help of a switch which is a big red slider type. Also, this provides for a hard-fix to the laser thereby overpowering its function of auto-leveling. Once the lock is disengaged, the laser alerts with a beep immediately it goes out of the range of the 4° leveling. Also, there is a minor control for each laser so they turn off/on, thereby letting you eliminate the beam that is either horizontal or vertical if required by you. Lastly, adjusting the intensity of the beam is possible as well, based on its use outdoors or indoors(additionally this results in extension of the batteries life span). Mounting of any lasers of this type onto a typical or standard tripod of a camera is easily possible. However, the ‘Cube 2-360’ laser possesses 2 nuts for mounting with quarter-inch threads situated at the unit’s bottom and back. Also, there is a magnetic mount (custom type)which we noticed to be beneficial for setting up the laser over any beam of steel during the leveling process at a commercial construction site. 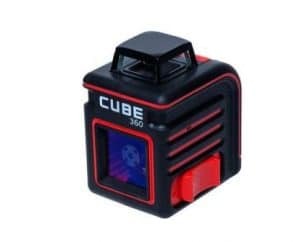 Additionally, we checked out the ‘Ultimate Edition’of ‘Cube 2-360 cross line’ laser that is accompanied with a plastic case (hard), a soft case,laser glasses (red color), 36-inch tripod, a magnetic mount and 2 nos. of AA type batteries. If you have never observed the manner in which glasses of red laser function in order to show the required line.We made use of the lasers of‘AdirPro Cube’in order to level a few storage platforms that were hanging within a building made of steel. A threaded rod was used for setting the supports of the level at the front, with the help of the laser level, we could easily match the lines (compared to the traditional level, where we would need to shift from back-to-front or one side to another side for this task of leveling). Well, I found the lasers of ‘AdirPro Cube cross line’very simple to work with. When working indoors, they were uniquely easy for configuration. Also, the extra features that the ‘Cube 2-360’ possesses make it an attractive enhancement for $195, approximately. No doubt, this price might double, it is very reasonable, considering that this product is able to provide laser leveling facility for 360 leveling accompanied by modes of dual intensity as well as a feature for locking the slope measurements. Usage of rotary lasers was done just some years back by me, for measurements indoor. Also, the new lasers of the prism-based type with their durability as well as price are revolutionizing the manner in which cross line type lasers are used at the site. Products of these type are definitely much more durable plus make use of lesser power for operation. All in all, we conclude that laser series of the ‘AdirPro Cubecross line’ is the best choice. However, currently, these are available online only and with chosen dealers (one such dealer is ‘Amazon’). Nevertheless, it wouldn’t surprise me if these immediately begin to be sold by well-known retailers.